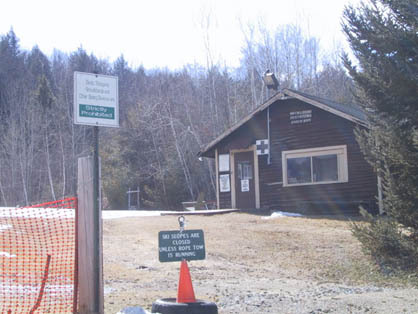 Abenaki Ski Area is located on Route 109A, a few miles northeast of Wolfeboro. It is owned and operated by the town of Wolfeboro. One slope and a couple trails are served by a rope tow. A Tucker snowcat is on hand to groom the slopes. Here are a few photos, taken in March of 2002. The area was not operating at the time due to the lack of snow! Looking up from the base of the area. Notice the trail map sign at the forefront of the picture. Hard packed snow/ice along the rope tow line indicates recent use. 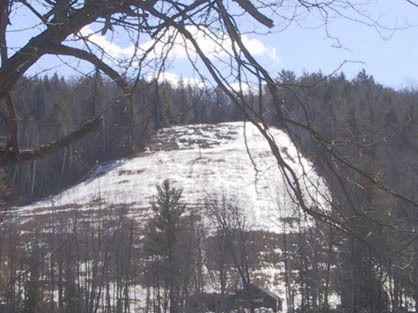 A view of Abenaki from Route 109A. A view of the base lodge. 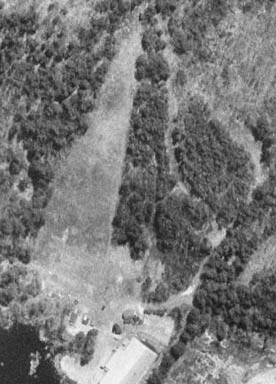 An overhead view of the ski area, 1998. Notice the main wide slope, and the few woods trails. 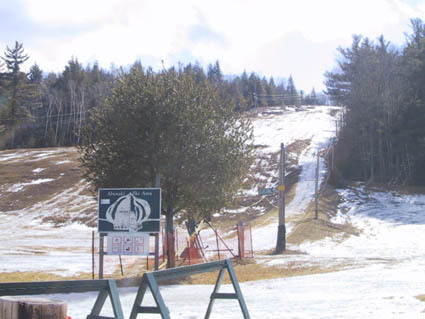 Does anyone have some great stories about skiing at Abenaki? If so, please let us know!